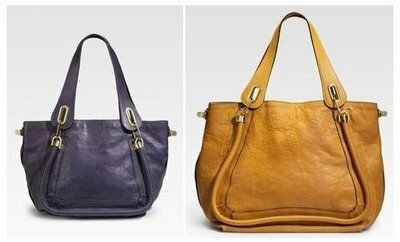 Get ready to climb aboard the 2009 designer bag bandwagon thanks to the Chloé Paratay Tote. This tote, a celebrity favorite and bona fide hit, is back in '09 and available in several colors and sizes. After comparing the large and medium Paratay totes to each other, I prefer the medium-sized version best. Both feature the Paratay's trademark dual shoulder straps with gold-tone metal accents as well as the curved piping design on the front and rear exteriors, but the dimensions of the large version allow the Paratay to loose its' unique shape and, therefore, its' appeal. I'd recommend sticking to the medium version's 12 x 9.5 x 8 dimensions which are ample enough to qualify it as a true tote. If you really need a larger bag, then hopefully the 21 x 14.5 x 8 measurements of the large Paratay tote will suffice.